She said once again that Viktor Yanukovych will never be considered Ukraine's legitimately elected president. On Saturday he finally congratulated his long-time rival, Mr Yanukovych, on a legitimate victory. Mr Yanukovych has asked Mrs Tymoshenko to step down from her post on several occasions. And she has said that she will not. As president, Mr Yanukovych does not have the right to fire or to appoint a prime minister - that is up to Ukraine's parliament. At the moment Mrs Tymoshenko's party is still part of the parliamentary coalition, but negotiations are under way to form a new coalition based on Mr Yanukovych's Regions Party. Once MPs form a new coalition they are likely to vote Mrs Tymoshenko's government out, but until a new government is formed - and that can take weeks in the current political situation - Mrs Tymoshenko will remain as acting prime minister under President Yanukovych. 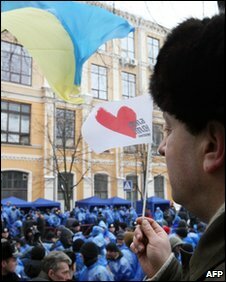 Mr Yanukovych has promised to improve the lives of those most disadvantaged - state workers and pensioners. Ukraine is also waiting for the much needed last tranche of the $16.4bn (£10.6bn) bailout programme from the International Monetary Fund. This payment was suspended last year - until after the presidential elections - with a specific demand from the IMF for political stability and a democratic transfer of power. However, Mr Yanukovych will have to consider what his rival stands for. Nearly half the country did, after all, vote for Mrs Tymoshenko, and he won by a small margin. 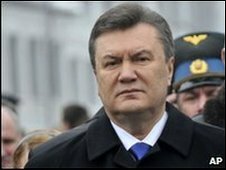 Just after the elections Mr Yanukovych said he was still undecided whether to visit Russia or an EU country first, but now the Kremlin is saying Mr Yanukovych will go to Moscow in early March.